I had some friends in Vegas last night and recommended we go to Buddy V’s at Venetian. Reviews have all been positive so this seemed like a safe bet. And it was a safe bet. The food wasn’t anything special but it’s not made to be special. It was just good and tasted like food that a friend’s grandmother would make. Again, that’s the idea. I had Grandma’s Sunday Gravy because it was Sunday and recommended. 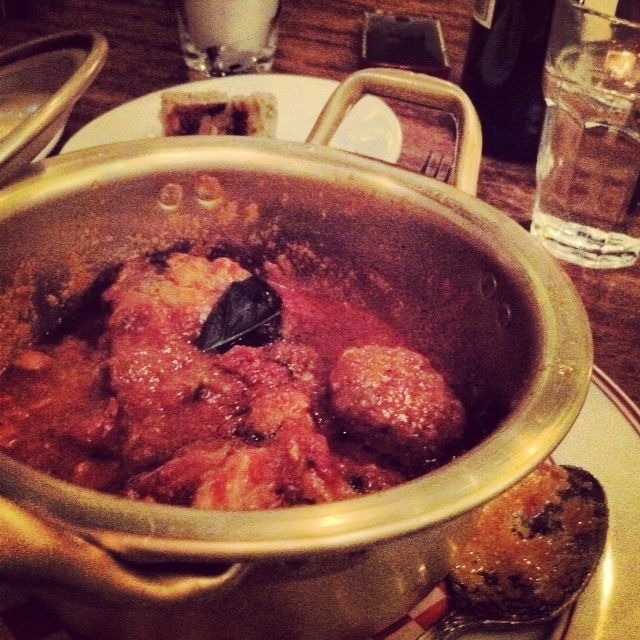 The dish was a pot of meatballs, sausage, lamb and beef with a nice sized plate of rigatoni. Most pasta dishes at Buddy V’s were around $20 but Sunday Gravy was $25 because of all of the meat. It was very good and the most full I’ve been in a long time. I didn’t even finish all of the meats. One of each (ok, 2 meatballs) was enough. With appetizers and a couple of bottles of wine dinner came out to about $62 a person before tip. The food is on par with other good mid-range Italian restaurants on the strip like Carmine’s at Caesars Palace. I’d return if someone wanted to have Italian but wouldn’t go out of my way. It’s good but, again, nothing special. If you spend about $10 more per dish you’ll have better food with a better view at Lavo.